Introduction to The Book of Antioch and illustration of upper left map corner in Part 1. 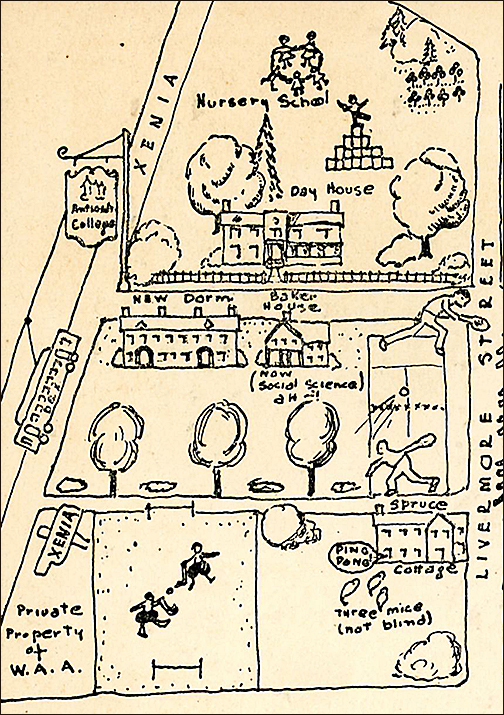 This post features the upper center portion of the map, showing perhaps some of the greatest differences with present-day Antioch (a tennis court on the east lawn?). For some reason Main Building has been turned 90 degrees. 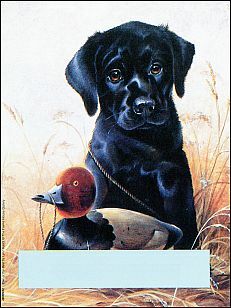 1994 marked the change of bookplate numbering to the use of the ISBN item suffix along with a product prefix (in this case JB0) as a response to the needs of major customers. All older designs still in the catalog were given new product numbers to fit the new system. The usual attempt to appeal to different tastes is reflected in this group. 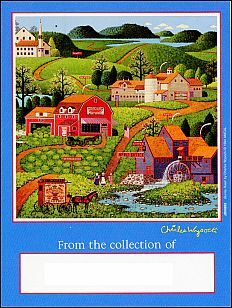 0089-2 is taken from “Burma Road” by landscape artist Charles Wysocki. 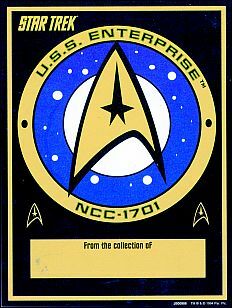 0090-6 is based on the uniform patch of the original Star Trek. 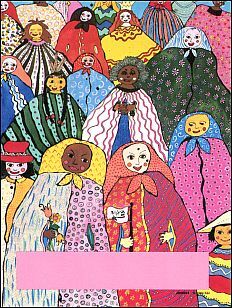 0091-4 uses “Many Strong and Beautiful Women’ by Mexican artist Kiki Suarez. 0092-2 adapts “Pair of the Best” by Lynn Kaatz. 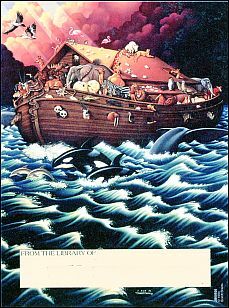 0093-0 is based on the Noah’s Ark as conceived by Braldt Bralds, an illustrator favoring the techniques of the Dutch Masters. 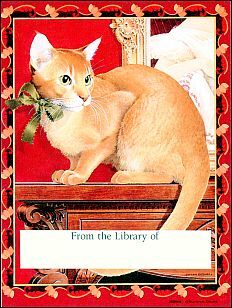 0094-9 adds to the collection of Antioch Publishing cat illustrations with one by Vivian Boswell, a Missouri painter who usually favors wild animals as subjects. 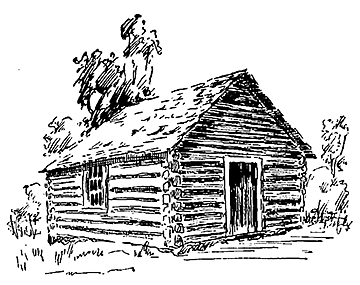 My first school-teacher was John Keifer who taught in the old log school-house described by brother Samuel in his pamphlet n “Early Settlers and Early Times”, chapter IV. Samuel’s list of scholars who attended school in this building was confined to the 20’s, 30’s and 40’s of the 19th century, hence my name does not appear in his list. My opportunity to be classed as a pupil in this famous old log school-house came in the year 1852-3, as near as I can fix the date by circumstantial evidence. At that time it was not necessary for a pupil to be six years old before starting to school. If he had an older brother or sister to guard his foot steps going and coming he might enter at the age of four or five. I was old enough to be thoroughly impressed with much that transpired in that primitive school-room during the sessions I attended. Benches without backs with wooden pins for legs, graded in height to suit the size of the pupils, furnished seats for all. A desk for a book-rest was not necessary. At least none was provided. 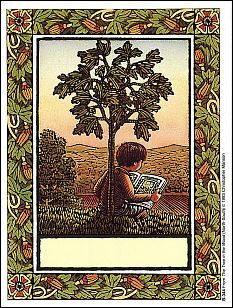 While studying books were held in your hands, and, to prevent soiling the leaves by a too vigorous grip of the thumb, a thumb-paper was used. This consisted of several thickness of paper, folded in a two-inch square, fastened to the bottom edges of the book-binding with a short string. 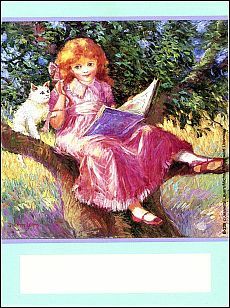 Thus it was always ready for use – a thumb rest when the book was open and a book-mark when it was closed. When learning to write a slate and slate-pencil constituted the necessary equipment for beginners. The small boy then as now would only make a muss with ink. The older pupils who were required to practice with pen and ink were seated on a high bench in front of a desk made of a board eighteen or twenty inches wide running the whole length of one side of the room. This make-shift writing shelf was placed immediately under a long window made by the omission of one log in the side of the building, the space being filled with a row of one-pane window glass probably 10 x 12 inches in size. Formerly oiled glazed paper served the purpose of window glass. I suppose I did not acquire much book knowledge my first year at school. 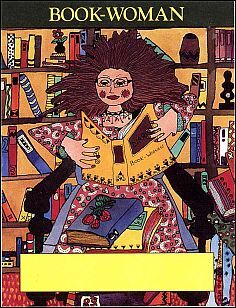 In fact I do not remember of having a book of my own. I did not need one, for when my teacher, Mr. Keifer, got time to give me a little mental exercise, which custom did not require him to do until the lessons assigned to the older scholars were attended to, he either called me to his side or he came and sat down beside me, having with him a spelling book containing the alphabet nicely arranged in columns in the following order: Big A, little a, big B, little b, big C, little c, and so on down the list to big Z, little z. I do not remember whether I knew my letters by eight before I started to school or not, but whether I did or not I was expected to satisfy the teacher by saying them over after him as he pointed to them with his pen-knife or lead pencil or whatever pointing instrument he possessed suitable for the purpose. By this process of repetition we in time were supposed to learn the names of the twenty-six letters and recognize them at eight. Their sound and use in spelling words would come later as the second step in the road to knowledge. 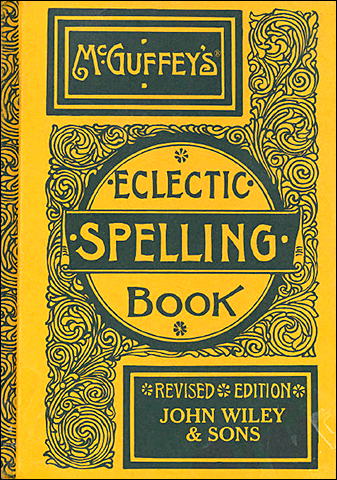 The spelling book was the pupil’s daily companion until he learned the sounds of letters combined in words of two or three letters each. It was common in speaking of a child’s progress at school to say that he had just begun his “a, b, abs”, or that he had finished them. 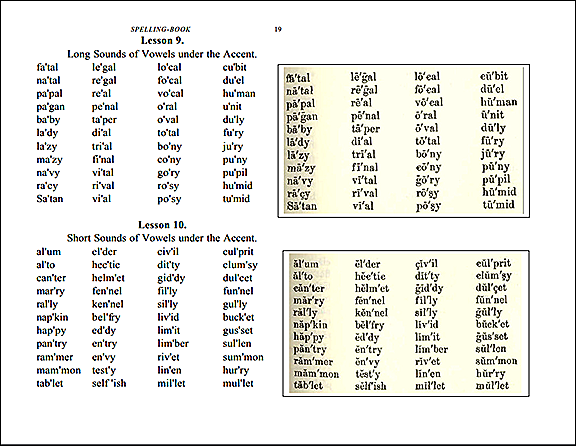 This means the drill in spelling words of one syllable especially arranged to acquire the sounds of the vowels as given on page 19 of McGuffey’s Eclectic Speller (which book see). By combining consonants with the vowels a, e, I, o. u, we spelled and pronounced as follows: a,b-ab; e,b-eb; i,b-ib; o,b-ob; u,b-ub. The process of memorizing was varied by the used of a consonant before the vowel, thus: ba, be, bi, bo, bu. 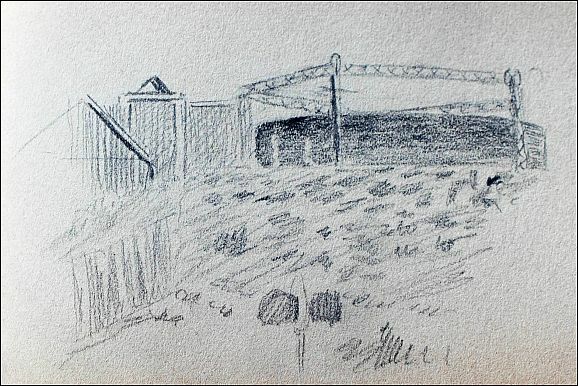 As we progressed a final consonants was added, thus: b,a,t – bat; c,a,t – cat, h,a,t – hat &e.
Day after day and week after week we were drilled in a monotonous manner through the various combination of letters in words of one syllable; then, as an encouragement, we were advanced to rods in two or my syllables, studying and pronouncing to ourselves as best we could; then in class recitation we repeated the process aloud from the book. 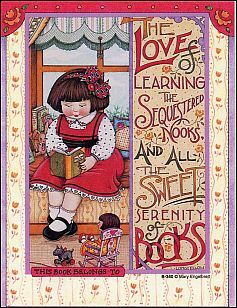 After this the books were closed and the teacher pronounced the words and we spelled them from memory. No one was supposed to be able to read until he had become fairly proficient in spelling, after the manner described, all the words in McGuffey’s speller or its equivalent. 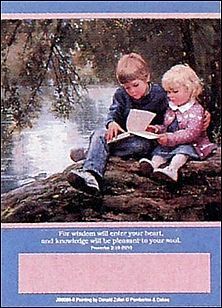 I remember quite well of my standing with a long row of spellers with my book open, watching carefully with finger in place for my word when it came my turn to spell. It was a crime not to be on the alert when it came your turn to perform. A crack on the head from the muscular force of the teacher’s thumb and finger was sometimes the penalty of inattention. So the timid pupil studied promptness as a matter of prudence as well as a virtue. Reminder: the Historical Society will be presenting a program on the CCC and other New Deal projects in Yellow Springs on April 7. 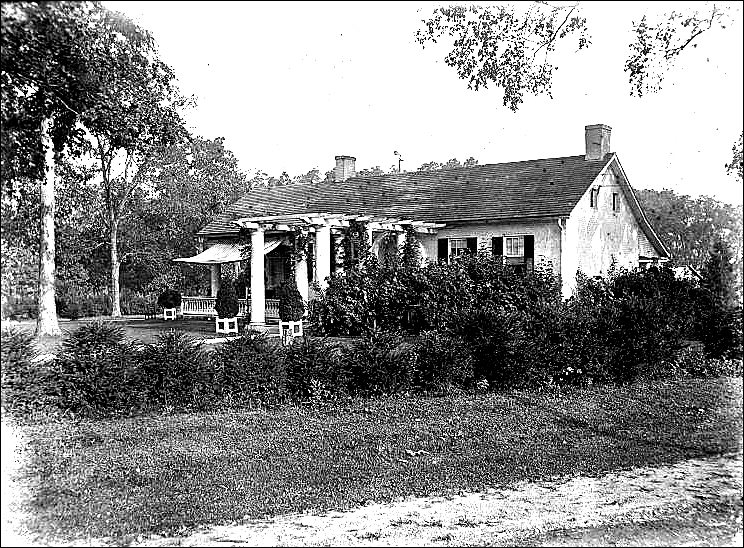 This blog has previously featured newspaper clippings concerning the CCC in Yellow Springs here and here, but another newspaper clipping among those collected by Mary E. Morgan concerned a project remarkable for its multi-county and multi-agency coordination which took place during the time of the CCC’s work. 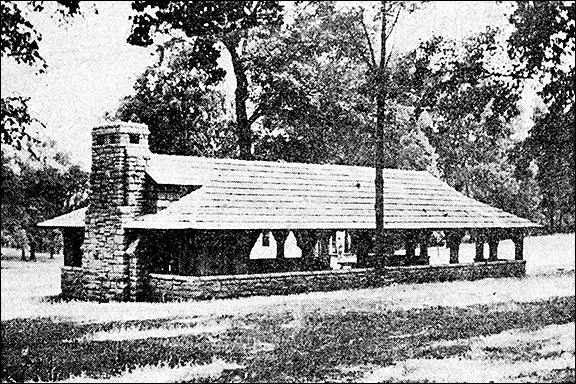 An open glade, slightly sloping, gives a restful setting to the rustic shelter house which is a popular gathering point for visitors to the Bryan State Park at Yellow Springs, O. Intensive work in the field of organization will comprise the activities of leaders in the 4-H Clubs and Boy Scouts Camp development campaign this week to raise $40,000 for the development of a juvenile recreation center in John Bryan State Park. Already most of the nine counties cooperating in the effort have had their preliminary meetings, with general organization on the program for the current week. Fayette County is leading the procession. Saturday, at 1:30 o’clock, in the Farm Bureau office in Washington C.H., Chairman Ralph Nisley and his associates, w. A> Bonner and mrs. Harold Zimmerman, with Ernest C. Janson and J. Lynn Gower representing the central committee, organized their 75 township and team workers right down the line to the last family with 4-H contact or general interest in public welfare. They propose to get their work started immediately in an effort to beat the weather to the chief interest of the farmers and other folks in their community. It is generally accepted when the farmers get into the fields and get started on their planting they have little time to think of other matters. “We are greatly encouraged by the reports coming to headquarters in the Chamber of Commerce Building,” stated Max M. Scarff, chairman of the central county committee. “The chairmen and their associates are getting back of this undertaking and we expect excellent results. We are aiming to leave no stone unturned in developing all possible resources for the financial support of this undertaking. “It is most essential that we cooperate fully with the National Park Service and the State of Ohio Forestry department. Never before has this community had an opportunity to attain such a fine objective as we are offered in John Bryan State Park. “We talk quite a bit about the swimming pool. Naturally that is something we can visualize, but the general recreational facilities are of just as great or greater importance. They make possible fellowship, the development of character, the enjoyment of nature and its beauties in the wonderful John Bryan State Park gorge. We need both and now we have opportunity to get the two virtually for the price of one. “In other words, if we had to build the swimming pool and bath house and pay for the entire cost, that would about consume the $40,000 which is our objective. With the National Forestry Service and the State of Ohio Department of Forestry taking care of this detail for the cost of materials for the pool, we certainly must go the limit in supporting this program. Starting Monday evening, at 7:30 o’clock, Mr. Scarff and his committee, composed of Ernest C. Janson, Harvey O. Portz and George M. Winwood, Jr., assisted by other members of the general committee, will be on the road virtually every day. The meeting Monday evening is in Xenia, at the High School, where William A. Anderson and his associates, Charles Adair, Mrs. Ruth Bradford Bloom and Earnest A. Drake, will set up their organization. Meetings are scheduled for Wednesday in London, Madison County; for Wednesday or Thursday in Urbana; for Monday, Feb. 28, in Highland County, with Clinton, Union and Logan Counties arranging for meetings during the current week. The Clark County township meeting was held last Wednesday. Township leaders now are arranging for their township meetings during the current week. The leaders then will come together for another session and start the fund raising effort in the rural districts. Harold S. Goodrich, chairman for Clark County, and in charge of the program of solicitation in Springfield, has called a meeting for the Scout Roundtable, composed of scouting executives and heads of Scout committees, for Monday evening at campaign headquarters in the Chamber of Commerce. The part they will be asked to play in the campaign will be outlined at this time. Meanwhile, captains of the various city divisions are mobilizing their team workers so that everything shall be in readiness for the general fund raising effort on Feb. 28. Among the most enthusiastic backers of the campaign are the boys in the Yellow Springs CCC camp. Some folks might observe that work is only work to them, but according to Supt. J. L. Mounts, who represents the National Forestry Service at Yellow Springs, the young men in the camp are eager to see the swimming pool get under way. They see the necessity of it with a river in sight, but with the hazards of swimming in it so great they hesitate to enter the water. Further they observe that perhaps if the nine counties backing this undertaking get a pool started other communities will see the advantage of it and when they go back to their homes they too will have safe and sanitary swimming and recreational facilities. Tree-shaded paths, fringing the winding course of the Little Miami River in Bryan State Park at Yellow Springs, is an idyllic spot for the Sunday afternoon stroll through the park. Nowhere in Byran State Park at Yellow Springs is the natural beauty more enhanced than where this arching bridge on the Old Pike rd. spans the bankis of the Little Miami River. 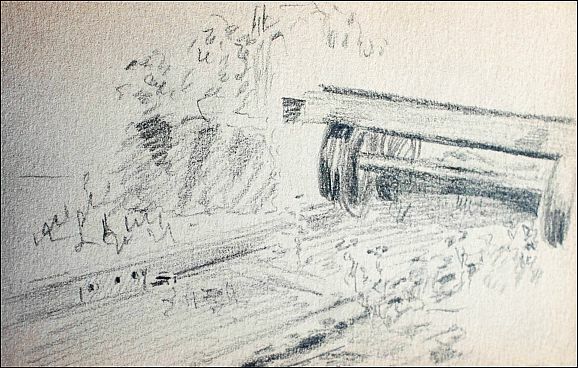 The sketch is by Steve Kilssaroff, a graduate of the Cleveland School of Art, formerly an enrollee of the Yellow Springs CCC camp. 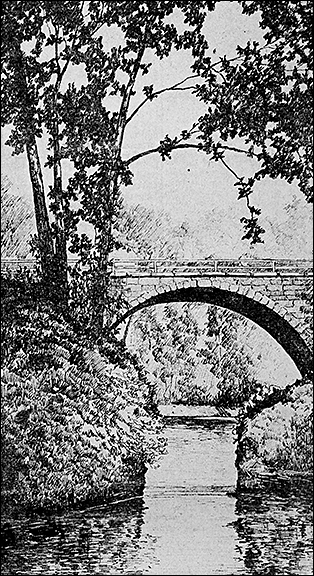 Kilssaroff has returned to Cleveland, but during the period of his service in John Bryan State Park he sketched many beauty niches. 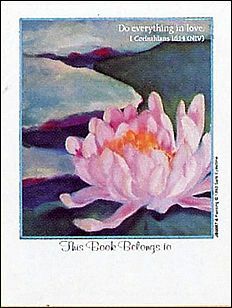 They are greatly prized by his former associates, many of whom have his water colors in their homes. 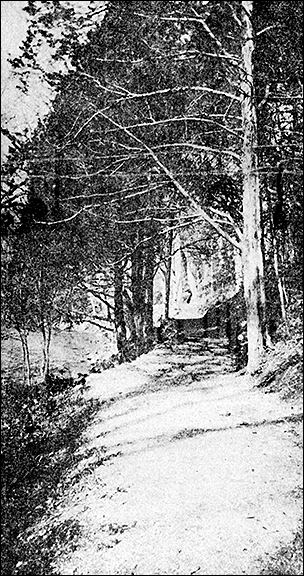 Kilssaroff, who spent the summer months in the camp and who has traveled widely in his work, declares he never saw a more beautiful location nor one that will be more appreciated in years ot come if its native settings are retained and its developments are such as will bring folks to the area to enjoy them. There is still a building known as the Whitehall Gatehouse, but it no longer looks anything like the picture. What other Yellow Springs buildings have been so radically redesigned? 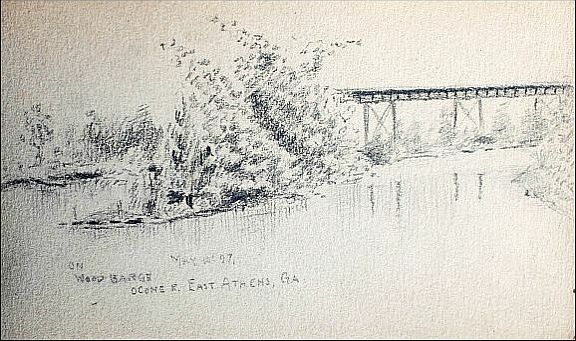 The first of this set has a caption identifying the location as “East Athens, Georgia.” Is that a hint that the artist came to Antioch from there? On Sunday, April 7, 2019, at 2:00 pm in the Yellow Springs Senior Center Great Room, Dave Neuhardt and David Casenhiser will present a program on the activity of the Civilian Conservation Corps (CCC) in John Bryan State Park and other New Deal projects in and around Yellow Springs. A book of modest size and unremarkable blue cover might be overlooked as an out-of-date textbook, but it turns out to be The Book of Antioch 1853-1929, with no author/editor attribution and printed by the Antioch Press. 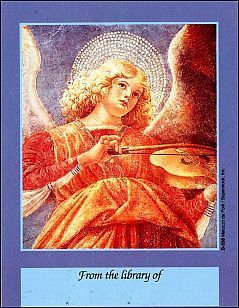 Within the covers you will find essays, poems, reprints of letters to the editor of Antiochian, pictures of class members, and engravings. 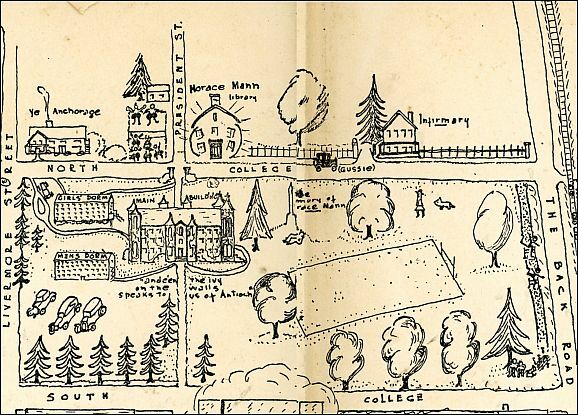 A whimsical map forms the endpapers, “observed and depicted by Virginia Gates Myers and Robert B. Sprague.” (Sprague was one of the Antioch students whose artwork Ernest Morgan used on bookplates – see here and here.) Portions of this map will be featured in separate posts so that the details can be appreciated. 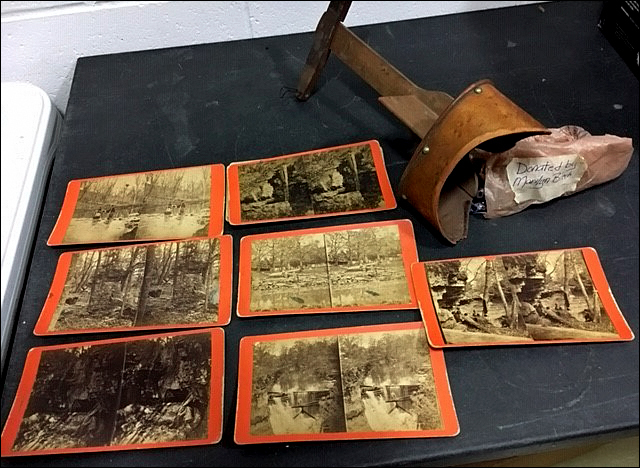 One of the items in the Historical Society’s collection is something for family entertainment pre-television. 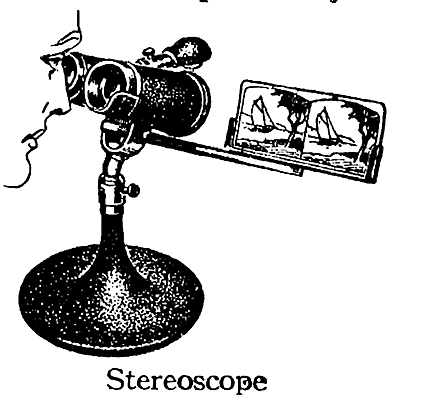 Stereoscope cards collected by families might be of national monuments and world tourist attractions, but there was also a big business creating stereoscope cards of local interest (see previoius posts here and here). 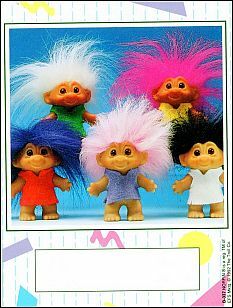 This group represents that last designs sold in a simpler world, since they are the last originally sold with product numbers in the “B series”. 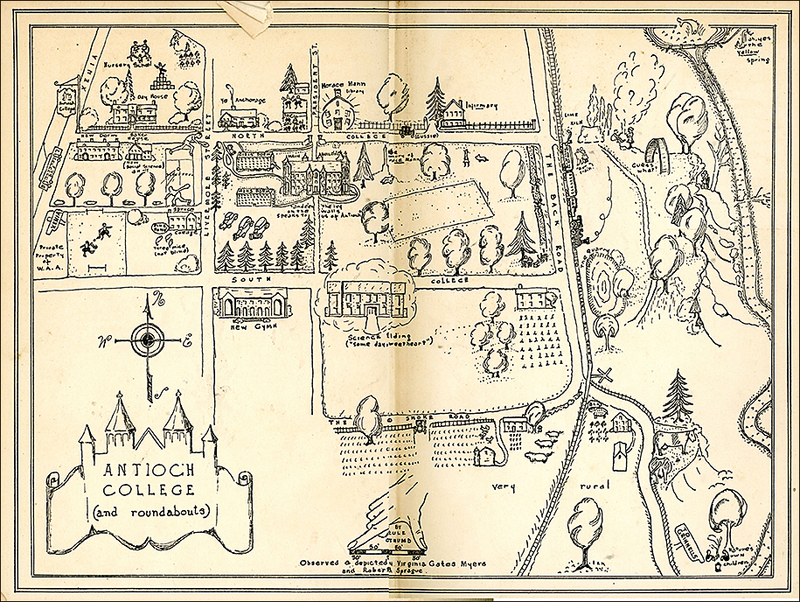 From this point on, all Antioch products would be sold with the ISBN as their product number, making Antioch products fit in with major customers’ computer systems, but making proofreading catalogs and order forms a nightmare, since hundreds of products would be included in any season’s offering. (To understand some of the weird world of product numbering, see this early post.) To complicate things even further, in later years bookplates would be sold in packages of different amounts (box of 50, packet of 12, etc. ), and each different package required a different ISBN. For a change there are no new cat designs, but these designs appeal to a variety of interests and age groups. 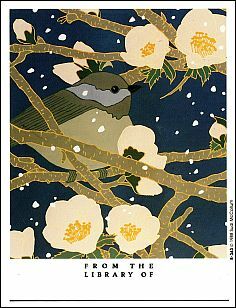 B-344 — taken from the illustrations by children’s artist/illustrator Christopher Manson’s work for The Tree in the Wood: An Old Nursery Song. B-346 — design for the Christian market based on a collectible plate design by Donald Zolan whose paintings of early childhood were licensed by Pemberton & Oakes. Includes Biblical quote Proverbs 2:10. 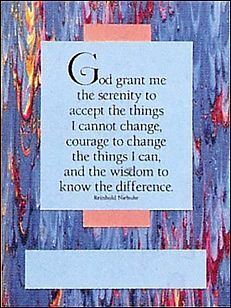 B-348 — Revamped design of the Serenity Prayer (originally W-45) against a background taken from a classical marble endpaper.